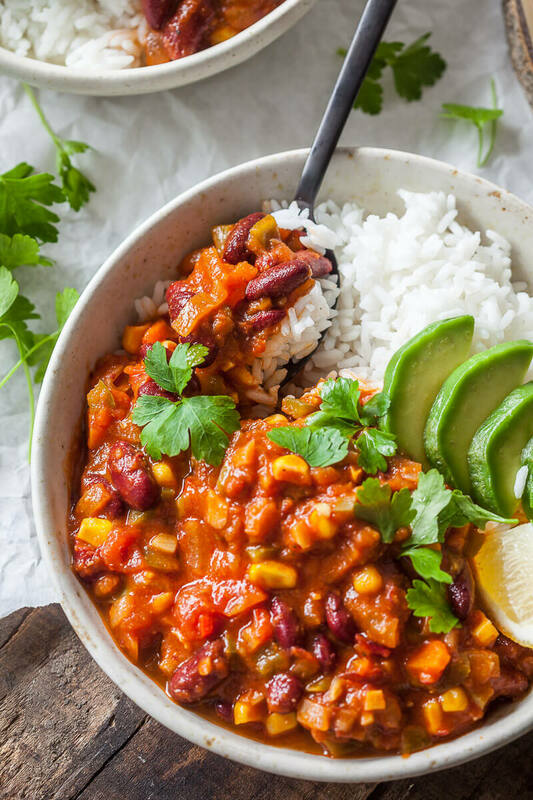 This Easy One-Pot Spicy Vegan Chili is packed with vegetables and ready in just 30 minutes. The perfect winter comfort food! In a pot, heat a tablespoon of oil, then add finely diced onions, carrots, garlic and celery. Gently fry while stirring, until the vegetables turn softer. Move the vegetables to the sides of the pot, then add a tablespoon of tomato concentrate in the center and fry until it turns a darker shade. Add diced bell pepper and finely diced chili, a bay leaf and pour in canned diced tomatoes and vegetable stock. Season with salt, pepper and ground cumin and simmer on low heat for about 20 minutes, until the vegetables soften. Once the chili is almost ready, remove the bay leaf, then using a stick blender quickly blend the chili but only give it a couple of blends and let it remain chunky. Serve the chili with a cup of plain cooked rice and some avocado slices.